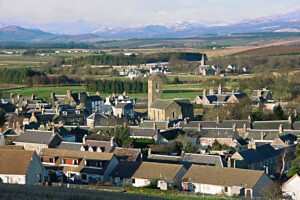 Latest change: Event Calendar updated 12th April 2019.
is based in the old Perthshire village of Dunning in Scotland. Dunning is steeped in history from the earliest days. There is an iron-age fort on the Dun Knock and a 1st century Roman camp at Kincladie. Saint Serf is said to have killed a dragon here, and there is a thorn tree planted in Jacobite times as well as a monument to Maggie Wall, burnt as a witch in 1657. 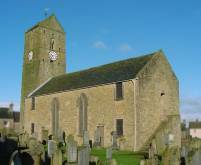 Our site includes St. Serf's Church graveyard survey and Dunning parish census records, both useful for genealogy research. Dunning is still very much a living, working village, its residents a mix of all ages and interests. We have a population of 1000, two churches, three pubs, several shops, a primary school, two parks, a golf course, tennis courts and a bowling green. Dunning Parish Historical Society was formed in July 1992 and has now grown to over 300 members including several overseas. We are committed to gathering and disseminating local history. To that end we have accumulated a large and varied quantity of historical information both written and photographic, and aim to play a major part in helping to decide local public history policy. Our web site was established in April 1998 and is still growing. We hope it will serve as a readily accessible example of conservation of local history. By storing digitally all this varied information and making it readily available through the internet we aim to Embrace the Future to Cherish the Past. Hundreds of summer visitors are drawn to the village by road signs advertising St Serfs church. DPHS and the Community Council combined to provide a visitor service which in the ten years to 2002 (when Historic Scotland took over) has guided visitors from over 25 countries and most parts of the UK. The Society's publication of gravestone inscriptions has helped many visitors in their research. Roughly painted on the stones of this 20 ft high monument one mile from Dunning are the chilling words: Maggie Wall burnt here 1657 as a Witch. What's it all about? Find out here. This complete site is Copyright DPHS. Please click here to see what this means.